Despite a few organizational hiccups, Friday’s “Rap the Vote” performance at Electra Nightclub brought out area hip-hop fans in force. 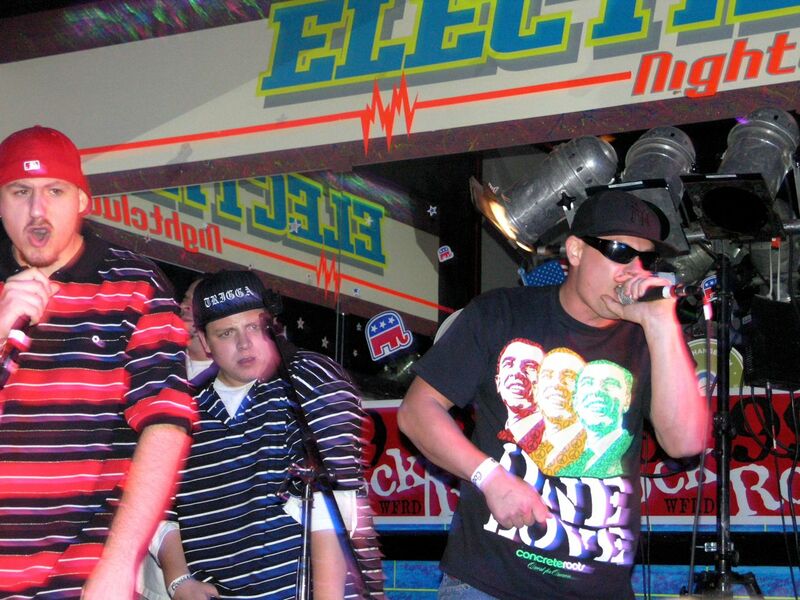 The show featured local rappers Open Case/Breadtruck, along with the Keene-based groups Flatliners and M.A.R., along with two others. The West Lebanon nightclub was festooned with political signs, though the planned voter registration table was scrapped when the State of New Hampshire pulled out at the last minute, citing manpower concerns. Still, there were a few red, white and blue elephants on the wall, and the McCain/Palin logo popped up occasionally on a computer slide show running behind the stage. But this was a decidedly Blue America crowd, with several styles of Obama t-shirts on display, a table crowded with candidate flyers and stickers (and a stack of Vermont voter registration forms), and Democratic posters dominating the walls. Senate candidate Jeanne Shaheen’s daughter Molly paid a visit as well. The evening featured a variety of urban styles. The headliners delivered the best set by far, combining melody, rhymes from rapper Problematic, and surprisingly good singing from J-Bust and Ill Dephyned. They occasionally veered off into misogyny (“Get Lost,” “Bedtime”), but were for the most part quite literate. Reflection, on songs like “Same Story” and “Only Greed,” won out over bluster and bravado, two traits that weigh down so much of genre. The same can’t be said, however, of Flatliners, who behaved more like a mob than a band. There were many problems with their set – it went too long, was drowned in f-bombs and “yo-yo” clichés, and generally lacked focus. But the worst moment came when a fog machine went into overdrive, forcing the club to turn on the house lights until the thick haze dissipated. The amateurish move sucked away a lot of the room’s energy, and when the smoke finally did clear and the lights went down again, half the crowd was gone. The sheer size of the bill also didn’t help, as the logistics of squeezing in five separate sets delayed Open Case/Breadtruck’s appearance until after midnight. There were other highlights over the course of the evening. DJ Grimee backed M.A.R.’s opening act, then teamed with rapper Bootz for a humorous election send-up, with the two assuming each candidate’s persona (sample rhyme – the faux McCain says “I can pop Viagra and blow like Niagara”). Each performer took pains to remind the crowd why they were there, sometimes bluntly so. “Y’all motherf****rs gotta vote,” said one rapper. He was preaching to the converted, perhaps profanely so. Yet it was refreshing for a genre that’s not exactly notorious for its civic energy.